Here is a timeline of how we got to modern day roller coasters and thrill rides. As we find out new things, we may update this timeline, so stay tuned! 1400’s: The first Russian Mountains appear. 1600’s: First rides in France. 1817: The first wheeled rides are built in Paris. 1840’s: The first looping coaster is built in Britain and exported to the Frascati Gardens in Paris. The loop has a 13-foot diameter and is at the base of a 43-foot tall drop. 1873: The Mauch Chunk Railroad, Pennsylvania, USA becomes the first ride to utilise a complete circuit. 1884: The first switchback railway, the Switchback at Coney Island, New York, USA – is opened. This proved that the general public would pay for the experience of riding in a car down a wooden track. 1884: A few months later, the first switchback railway specifically built for amusement with a complete circuit was also opened at Coney Island. 1885: The first switchback railway to use a chain lift opens in San Francisco, California, USA. 1887: The first scenic railway opens in Atlantic City, New Jersey, USA. 1887: The first ride with a figure-8 design opens at Haverhill, Massachusetts, USA. 1891: The first switchback railway in Europe opens in Blackpool, England. 1891: The first ride with a vertical loop is built. Due to excessive G-forces it closes soon afterwards. 1902: The oldest ride currently operating, the Leap-the-Dips at Lakemont Park, Pennsylvania, USA, opens. 1907: The Drop-the-Dips ride opens, with the first use of a lapbar restraint. 1919: The Jack Rabbit at Clementon, New Jersey opens. It is the oldest ride still residing in its original location. 1923: The Big Dipper at Blackpool Pleasure Beach opens. 1924: The Pippin opens at Kennywood, Pennsylvania, USA. It is now called the Thunderbolt. 1924: The Giant Dipper at Santa Cruz, California opens. It is still operating. 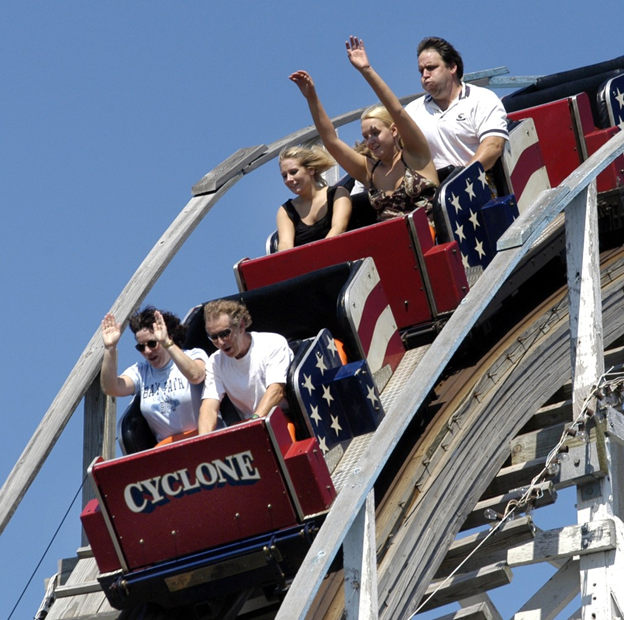 1925: The Cyclone at Revere Beach, Massachusetts opens. Due to low patronage, it soon closes. 1925: The Giant Dipper opens at Belmont Park, San Diego, California. It is still operating. 1927: The Lightening at Revere Beach opens, only to close again a few years later due to its horrific accident rate and low patronage. 1927: The fabled Coney Island Cyclone opens in New York. 1927: The Racer opens at Kennywood. The first coaster with a mobius track layout. 1929: The Wall Street Crash. This marks the end of the first Golden Age of coasters. 1935: Grand National opens in Blackpool. Second mobius track layout. 1939: Texas Tornado at Frontierland, Morecambe, England opens. It has now sadly been dismantled. 1947: The Phoenix opens at Joyland Park in San Antonio, Texas, USA. It is now located at Knoebels, Pennsylvania. 1948: The Crystal Beach Comet opens. It is now at Lake George, New York. 1953: The first roller coaster built by Togo opens in Japan. The Roller Coaster at Hanayashiki Amusement Park in Tokyo is still operating. 1955: Disneyland opens in California. This begins to stir the public’s interest in theme parks again. 1957: Anton Schwarzkopf builds his first roller coaster. the Düsenspirale. It toured Germany for seven years, then resided at Vienna’s Wiener Prater park for a further four before closing. 1959: The Matterhorn opens at Disneyland. This is the first coaster to use tubular steel track, and the first coaster manufactured by the company Arrow. 1962: Mack open their first roller coaster, the Broadway Trip at Fun Forest Amusement Park in Seattle, Washington, USA. 1964: Mr Twister opens at Elitch Gardens, Denver, Colorado, USA. 1964: Serpent of Fire opens at La Feria Chapultepec Magico, Mexico City, Mexico. The first coaster to achieve a height of 100 feet, it was the tallest ride in the world for over 10 years, and also the third coaster with a mobius track. 1968: The first of the successful Jet Star coasters by Schwarzkopf opens, at Prater Park in Vienna, Austria. 1968: Pinfari open their first coaster, the Himalaya at Luneur park in Rome, Italy. 1972: The second golden age of coasters begins with the opening of the Racer at Paramount Kings Island, Ohio, USA. 1975: The first corkscrew roller coasters open. They are all located at parks in the USA – California’s Knotts Berry Farm, Illinois’ Old Chicago and Tennessee’s Opryland. 1976: Revolution, the first coaster to successfully feature a vertical loop, opens at Six Flags Magic Mountain, Valencia, California, USA. 1977: First shuttle loop opens at Paramount Kings Dominion, Doswell, Virginia, USA. It was dismantled in 1986, but then appeared at Alton Towers in England briefly in the early 1990’s. It is now located at Hopi Hari, Sao Paolo, Brazil. 1978: Revolution opens in Blackpool, the first ride in Europe with an inversion. 1978: The first coaster containing three inversions opens at Cedar Point, Sandusky, Ohio, USA. 1978: The first coaster on mainland Europe with an inversion opens – the transportable Looping Star, made by Schwarzkopf and operated by German showman Oscar Bruch. 1979: The Beast, the longest wooden coaster in the world at 7400 feet, opens at Kings Island. 1979: Intamin build their first coaster, the kiddie ride Junior Gemini at Cedar Point. 1980: Corkscrew opens at Alton Towers, England, the first coaster in the park. It also marks the beginning of the UK theme park boom. 1980: The first coaster to feature a boomerang inversion element opens, the Orient Express at Worlds of Fun, Kansas City, Missouri, USA. 1981: Intamin build their first wooden coaster, the American Eagle at Six Flags Great America, Gurnee, Illinois, USA. 1981: The first suspended roller coaster, the Bat, opens at Kings Island. It is now dismantled. 1982: The first five inversion coaster opens, the Viper at Six Flags Darien Lake, Darien Center, New York, USA. 1982: The first of Vekoma’s boomerang coasters is built at Reino Aventura, Mexico City, Mexico. This is also the first ride with six inversions. 1982: The world’s first stand-up roller coaster opens in Japan. 1984: Giovanola open their first coasters – the Sarajevo Bobsleds at Six Flags Great Adventure and Six Flags Magic Mountain, and the Screamin’ Delta Demon at Opryland. The latter is now in storage whilst the other two have been relocated to the Great Escape park in Lake George, New York, USA and Six Flags Over Texas, Arlington, Texas, USA, respectively. 1985: The re-built Phoenix opens at Knoebels, Elysburg, Pennsylvania. 1987: Vortex, the first continuous circuit ride with six inversions opens, at Kings Island. 1988: Shockwave at Six Flags Great America opens. The first coaster with seven inversions, it was dismantled in 2004. 1989: Magnum XL-200 opens at Cedar Point. It is the first coaster to reach a height greater than 200 feet. 1989: Goudurix opens at Parc Asterix, Plailly, France. It is the first coaster in Europe with seven inversions. 1990: Iron Wolf, the first B&M coaster, opens at Six Flags Great America. 1990: Reverchon open their first coaster, the Tigre de Sibérie at Le Pal park in Dompierre Sur Bresbe, France. 1991: RCCA open their first coaster, Pegasus, at Efteling in the Netherlands. 1991: The Ultimate opens at Lightwater Valley, England. Until recently the world’s longest roller coaster at 7452 feet. 1992: Batman: The Ride, the first inverted coaster, opens at Six Flags Great America. It contains five inversions. 1992: CCI open their first coaster, the Sky Princess at Dutch Wonderland in Lancaster, Pennsylvania, USA. 1994: Raptor opens at Cedar Point. The first inverted coaster with six inversions. 1994: The re-built Comet opens at Lake George, New York. 1994: Nemesis opens at Alton Towers. Europe’s first inverted coaster. 1994: The first of Vekoma’s Suspended Looping coasters opens at Walibi World, Holland. 1994: Shockwave opens at Drayton Manor, England. The first, and currently only, stand-up roller coaster in Europe. 1994: Desperado in Primm, Nevada, USA becomes the tallest coaster at 209 feet. 1994: The Pepsi Max Big One at Blackpool then steals this crown with a height of 235 feet. 1994: Mr. Twister is demolished when Elitch Gardens in Denver moves location. 1995: Dragon Khan opens at Port Aventura, Tarragona, Spain. It is the first coaster with eight inversions. 1995: Twister II, the replacement for Mr. Twister, opens at Elitch Gardens. 1996: Morgan build their first coasters, the Wild Thing at Valleyfair! in Shakopee, Minnesota, USA and the Santa Monica West Coaster at Pacific Park in Santa Monica, California, USA. 1996: GCI open their first roller coaster, the Wildcat at Hersheypark in Hershey, Pennsylvania, USA. 1996: Maurer-Sohne open their first coaster, the Kopermijn at Drievliet Family Park in the Netherlands. 1996: Fujiyama at Fujikyu Highlands, Japan, becomes the tallest coaster at 259 feet, as well as having the greatest drop at 235 feet. 1996: Megafobia opens at Oakwood Leisure Park, Wales. 1996: One of the most unusually located roller coasters opens, the High Roller atop the Stratosphere Tower in Las Vegas, Nevada, USA. It is 1149 feet above street level. 1996: Montu opens at Busch Gardens Tampa, Tampa, Florida, USA. The first inverted coaster with seven inversions. 1997: Superman: The Escape opens at Six Flags Magic Mountain. It is the fastest roller coaster at 100mph, and also the first to utilise LIMs for propulsion. 1997: Stampida opens at Port Aventura. The first wooden racing coaster on mainland Europe. 1997: The first Vekoma Inverted Boomerang coaster – known as an Invertigo – opens at Liseberg Park in Sweden. Called Hang-Over, it was closed in 2002. 1997: Alpengeist opens at Busch Gardens Williamsburg, Williamsburg, Virginia, USA. Currently the tallest and fastest inverted coaster at 195 ft and 67 mph respectively. 1998: The first vertical drop coaster, Oblivion, opens at Alton Towers. 1998: Gerstlauer open their first roller coaster, the G’sengte Sau at Tripsdrill in Cleebronn, Germany. 1999: The first wooden roller coaster in South America opens, Montezum at Hopi Hari, Sao Paolo, Brazil. 1999: The first B&M floorless coaster opens, Medusa at Six Flags Great Adventure. 1999: The first B&M hypercoaster opens, Apollo’s Chariot at Busch Gardens Williamsburg in Virginia, USA. 2000: Goliath opens at Magic Mountain. It has the greatest drop at 255 feet. 2000: Millennium Force opens at Cedar Point, at 310 feet high. It is the first coaster with a circuit to exceed 300 feet; it also now has the greatest drop at 300 feet. 2000: Katun, the first inverted coaster on mainland Europe opens at Mirabilandia, Ravenna, Italy. 2000: The first LIM launch coaster in Europe opens, Superman the Ride at Six Flags Holland, Biddinghuizen, Holland. 2000: Son of Beast opens at Kings Island. It is the first wooden coaster since the flip flap railway to contain a vertical loop. It is also the tallest, fastest and highest dropping woodie at 218 feet, 78 mph and 204 feet respectively. Also, due to the height, the first wooden hypercoaster. 2000: The first flying coaster, Stealth, opens at Paramounts Great America, Santa Clara, California, USA. It closed in 2003 and was moved to Paramount Carowinds in Charlotte, North Carolina, USA, where it is called BORG Assimilator. 2000: Steel Dragon opens at Nagashima Spaland, Nagashima, Japan, and sets four new records. The tallest at 318 feet, the longest at 8133 feet, the fastest circuit coaster at 95 mph as well as the one with the greatest drop at 307 feet. 2001: Hypersonic XLC, the first air-powered roller coaster, opens at Paramount King Dominion, Doswell, Virginia, USA. It is also the first coaster by S&S. 2001: Europe’s tallest and fastest wooden coaster opens. Colossos at Heide Park in Soltau, Germany is 190 feet tall with a top speed of 74mph. 2002: X, the first 4th Dimension coaster, opens at Six Flags Magic Mountain, Valencia, California, USA. 2002: Europe’s tallest roller coaster opens, the 240 foot-high, B&M-built Silverstar, at Germany’s Europa Park. 2002: The first B&M flying coaster, Air, opens at Alton Towers, Staffordshire, England. 2002: Colossus opens at Thorpe Park in Surrey, England. This coaster is the first to contain 10 inversions. 2002: The first Zamperla flying coaster opens. Called Flying Coaster, it is located at Six Flags Elitch Gardens. 2002: Europe’s first floorless coaster, the 7-inversion, B&M-built Superman: Ride of Steel opens at Warner Bros. Movie World in Madrid, Spain. 2003: Top Thrill Dragster opens at Cedar Point, Sandusky, Ohio, USA. It becomes the world’s tallest coaster at 420 feet and the fastest at 120 mph. 2003: Vild-Svinet opens at BonBon-Land in Denmark. It becomes the world’s steepest coaster, with an initial drop of 97-degrees. 2003: The first S&S wooden coaster opens, Timberhawk at Wild Waves and Enchanted Village in Washington, USA. 2003: The first Intamin half-pipe coaster opens, at Särkänniemi park in Tampere, Finland. 2003: The world’s steepest wooden coaster opens. Balder at Liseberg in Gothenberg, Sweden, has a 70-degree first drop. 2004: The first Vekoma motorbike coaster, Booster Bike, opens at Toverland in the Netherlands. 2005: Kingda Ka at Six Flags Great Adventure in jackson, New Jersey, USA becomes the tallest and fastest coaster with a height of 456 feet and a top speed of 128mph. 2005: The first X-car coaster opens at Drayton Manor. 2005: SheiKra, the first B&M vertical drop coaster in North Amerca opens at Busch Gardens Tampa. Special Thanks to Andrew Rathe for providing the initial copy of the timeline.